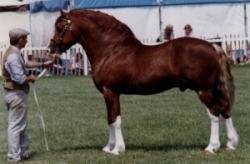 Section D - Volume LXXII - Chestnut, blaze and four white socks. - Foaled 1991. Nebo Thomas was born in May 1991. He has been regulary shown since a yearling. He won The Royal Welsh as a two-year-old and went on to be Reserve Youngstock Champion. As a three-year-old he went one step further and took the Youngstock Champion. The same year his half brother Nebo Hywel won The George Prince of Wales Cup. He is producing lovely foals and passing on his kind temperament to his offsprings. He has been broken to ride and drive and is a pleasure to handle in any situation.